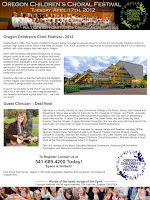 2012 Oregon Children’s Choral Festival! The Oregon Children's Choral Festival was established in 1982 to provide an annual venue for school and community children's choirs to perform high quality choral music in the state of Oregon. 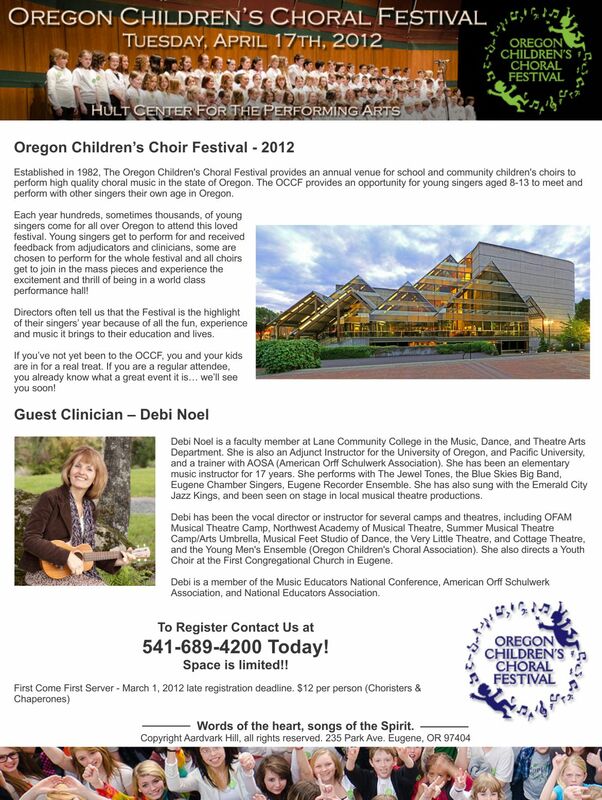 The OCCF provides an opportunity for young singers aged 8-13 to meet and perform with other singers their own age in Oregon. Each year hundreds, sometimes thousands, of young singers come for all over Oregon to attend this loved festival. Young singers get to perform for and received feedback from adjudicators and clinicians, some are chosen to perform for the whole festival and all choirs get to join in the mass pieces and experience the excitement and thrill of being in a world class performance hall! Directors often tell us that the Festival is the highlight of their singers’ year because of all the fun, experience and music it brings to their education and lives. If you’ve not yet been to the OCCF, you and your kids are in for a real treat. If you are a regular attendee, you already know what a great event it is… we’ll see you soon! Debi Noel is a faculty member at Lane Community College in the Music, Dance, and Theatre Arts Department. 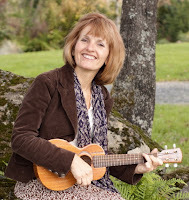 She is also an Adjunct Instructor for the University of Oregon, and Pacific University, and a trainer with AOSA (American Orff Schulwerk Association). She has been an elementary music instructor for 17 years. She performs with The Jewel Tones, the Blue Skies Big Band, Eugene Chamber Singers, Eugene Recorder Ensemble. She has also sung with the Emerald City Jazz Kings, and been seen on stage in local musical theatre productions. Debi has been the vocal director or instructor for several camps and theatres, including OFAM Musical Theatre Camp, Northwest Academy of Musical Theatre, Summer Musical Theatre Camp/Arts Umbrella, Musical Feet Studio of Dance, the Very Little Theatre, and Cottage Theatre, and the Young Men's Ensemble (Oregon Children's Choral Association). She also directs a Youth Choir at the First Congregational Church in Eugene. Debi is a member of the Music Educators National Conference, American Orff Schulwerk Association, and National Educators Association. 1. Please download, print and fill out the Registration Form. (Click on the small form at left, then click on the "Show Original" link at bottom left of that image. You can then PRINT or "Right-Click" and "Save As" the image to your computer for use). 2. Please also give us a quick email back indicating that you will be coming and how many you’ll be bringing! That will help a lot with our planning! To help keep costs as low as possible, we won’t be sending out a paper mailing this year, and we don’t have a full list of email addresses for groups that might like to attend. Please forward this file to any school or community music teachers that you think might be interested! Help spread the word! We look forward to this year’s festival with great excitement! You can use our Contact Us page to inquire about more information.